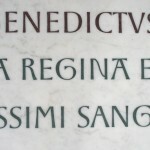 Typography alumna, Caroline Webb, has designed and installed a new Papal inscription for Westminster Cathedral, to commemorate the visit of Pope Benedict in 2010. 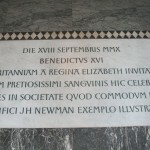 The 7 foot long inscription is made of one piece of Carrara Marble inlayed with letters of green and red Porphery and lies in the main entrance to the Cathedral. The marble inlay was done by Pietra Dura craftsman Thomas Greenaway.The inscription took 2 years to design and produce, and a week to fix in the floor. The commission was technically challenging in every way; Caroline will be writing a full article to document its creation.